The original Norman Castle was built in 1071 and given to Henry de Ferrers, a powerful Norman baron, who held over 200 manors. His family later came to prominence: Robert de Ferrers was created Earl of Derby in 1138 and the castle passed to his descendants. In 1263, civil war broke out in England. The then Earl of Derby supported Simon de Montfort in the Baron’s Revolt against Henry III. The rebels were defeated in 1265 and their possessions confiscated. 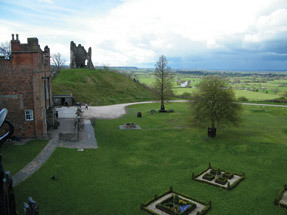 Henry III gave Tutbury Castle to his son Edmund whom he created Earl of Lancaster in 1267. The castle has remained in the hands of the Earls and Dukes of Lancaster ever since. Not all early visitors to Tutbury Castle in Staffordshire enjoyed the experience. Mary, Queen of Scots spent long periods there as the prisoner of Elizabeth I. Her first visit was in 1569; she was held there on and off over the next fifteen years. Mary loathed Tutbury; she described it as “sitting squarely on top of a mountain in the middle of a plain”. Mary’s stay came to an end in 1585, when she was moved to Fotheringay Castle and executed there a month later. In 1646, during the English Civil War, Tutbury Castle fell to Parliamentary forces. After a siege it was destroyed leaving the ruins visible today.